Love, Actually: April Showers bring...ROMANCE! Sometimes, I think our guys just need a little anticipation. I don't say that because I read their minds...it's just that my husband told me so. And, to me, he IS the expert. In fact, today's post is HIS clever idea. 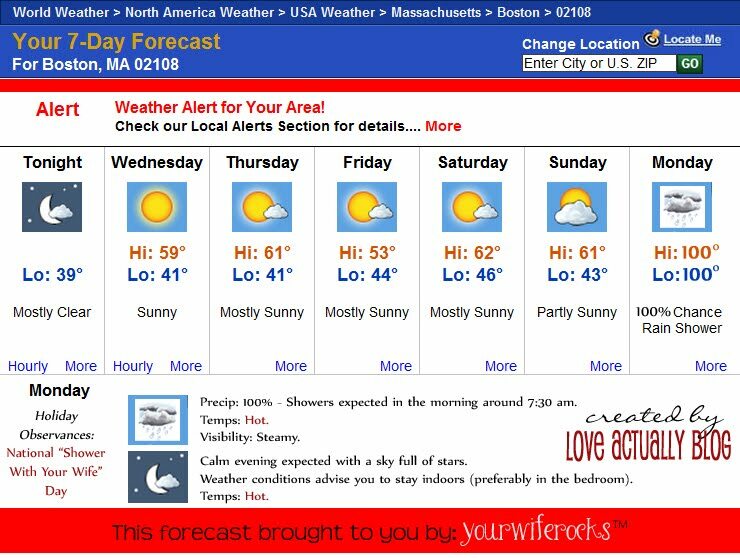 I took a clip of a weather forecast online (I used the 7-day forecast from weatherbug.com) and photoshopped it to my heart's content! This was the result (look closely...this isn't just any normal forecast). I placed it in an envelope with a note, "Thought you might be interested in the forecast for Monday." 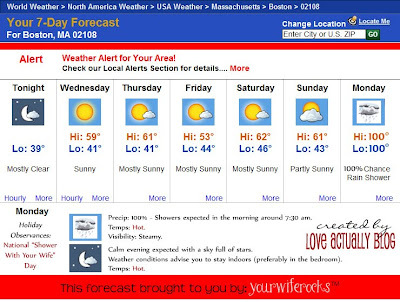 *If you have Windows 7, use your "Snip Tool" to copy the screen image of your forecast. 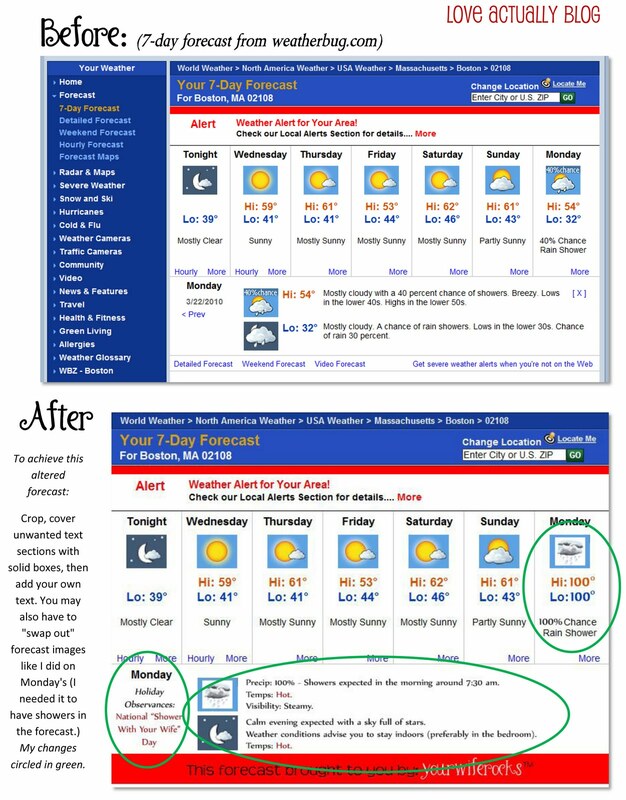 *If you have Windows XP or older, click shift+PrintScreen button and then open Microsoft Word and click paste or CTRL V. Your forecast image should appear. *You can edit the image in Word and then print. *If you pasted the image into Word, but want to edit it in Photoshop, save the document as a PDF, and then open that file in Photoshop for editing. If you really want to play up this idea, you can pair THIS (Starry Night) date night to match your evening forecast perfectly! I love this idea!! So cute. Can't wait to use it!! hahaha! Totally doing this one! Aweosme! I love your ideas for romance. Found you via Sumo. Have a blessed week! THANK YOU! I did this last night and when my husband got home he saw it. He loved it, took and picture on his phone and sent it to his buddy. Braggin rights i guess. hah! that's awesome that he took a picture, Amanda! Love it!! Tried this last night but gave it to him a few days previous to create "anticipation" as you put it. IT WORKED! He mentioned DAILY how excited he was for Sunday's rain shower. THANKS! This is one of the funnest ideas I've seen. LOVE IT! I just did this and sent it in an e-mail to my hubby at work...I feel so giddy wondering what his reaction will be...feels like being newly weds again, it's amazing...thank you!!! I just did this for my fiance. We're getting married on Saturday. Who knew that next week was going to be SOOOO hot?! 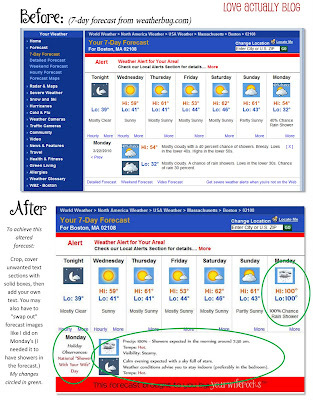 I guess Accuweather has changed their format cuz I have no idea how to do this now. Such a cute idea though! Really wish I could figure it out!